Today’s the day: the big interview. You’re dressed to the nines, your crisp, freshly-printed resume tucked safely in your bag. You’ve researched the company and planned your questions to perfectly illustrate your ability and interest. Your route has been mapped, travel time confirmed, Uber ordered. You’ve spent enough time in the mirror practicing your jovial but self-possessed greeting and perfectly adjusting your coif that you’ve memorized every pore on your face. For all intents and purposes, you’re prepared, but there’s still one snafu: what do you do about the gay thing? For LGBT job candidates, this is still a troubling question. Though we live in a remarkably tolerant time, discrimination is a very real concern, and it can be difficult to choose a tactic for broaching the matter of diversity in the workplace. Sexual orientation is not a protected class in employment outside of the federal workplace, complicating the matter further. So what does one do? It’s illegal for your interviewer to ask about, so the onus is on you as the interviewee to bring it up; if there’s no reason to touch on the subject, why bother? If you do decide to establish your LGBT status, without federal protection, this is a wise step to take, though saddening advice to hand down. Some states and a handful of cities and counties have laws prohibiting discrimination based on sexual orientation and/or gender identity. If you’re harboring hesitations about outing yourself, finding that you do have some legal protections might ease your anxiety. If you find that you’re in an area where such laws don’t exist, you might feel comfortable choosing not to bring it up at all. Many people separate their work and personal lives completely for any number of reasons; if you fear ramifications based on your LGBT status, this might be a reasonable choice. Of course, you must also decide if you feel right working for a company who you’re concerned would discriminate against you. Dealing with the dichotomy of such a situation could become immensely stressful, especially if you must worry about the consequences of being found out. For some, concealing a part of their identity for the workplace is irrelevant; for others, this might as well be a death sentence. Regardless, knowing your legal protections can be abundantly useful in either case and might help sway a decision if you’re on the fence. If you’ve decided that you do want to make your diversity clear but don’t relish the thought of possibly putting off your interviewer with a heavy-handed confession, there are a few ways to plant clues in your resume that you or your interviewer can then use to bring up the subject organically. This includes adding in leadership roles or internships with LGBT organizations, time spent volunteering with LGBT groups, or membership in your school’s LGBT group. Otherwise, try to find openings in interview questions to slip it in naturally. For example, use a question about your strengths to describe your devotion to diversity in the workplace and, as an LGBT individual, the high value you place in fostering an accepting environment. With the promotion of diversity in workplace today, you’ll more than likely be asked a diversity question you can use as a coming out question and won’t have to strive to be inconspicuous, but it’s good to be prepared for every eventuality. If you’d like to know about culture in the company and how it will mesh with your LGBT status, consider the questions you’d like to ask your interviewer. This should generally come towards the end of the interview process, when you sense the company is close to making you an offer; you want to focus on your expertise and how you’ll be a benefit to the company in the early stages. The latter parts, however, should be used to find out if the company is a good fit for you, e.g. by asking questions about diversity in the workplace. 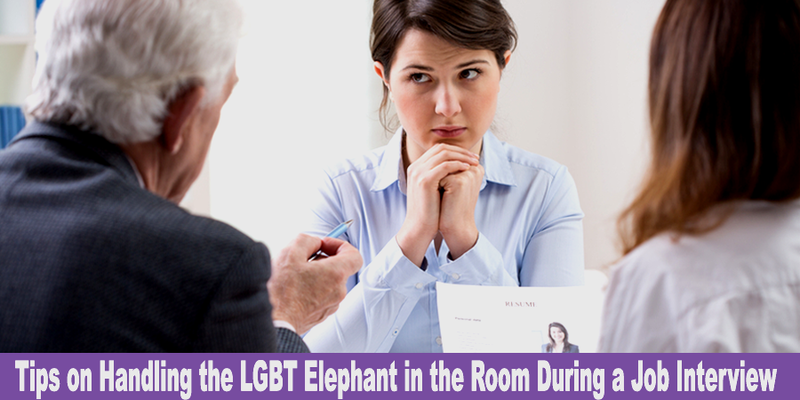 If you feel uncomfortable asking the interviewers you meet, you might call the hiring manager and ask to speak to an LGBT employee. The very nature of asking such a question will give you a clue toward how accepting the company is; somewhere you want to work for should have no problems with such a request and, indeed, has probably fielded it often. Your LGBT status should well be something you’re proud of, but your potential employer doesn’t see your sexual orientation as their primary interest. Don’t try and foist your diversity upon your employer; if it comes up, it should be as a natural extension of your expertise, or as it relates to your fit in the workplace culture. Your sexual orientation will not land you a job, and if it does, you should question if you’re going to be valued for the know-how you bring, or for tokenism. Be yourself, and ensure you feel comfortable doing so— you don’t want to feel like you need to be a caricature in order to enjoy success.